The Loweswater fells fall into two groups. To the south of the lake is a group of fells that stretch out from Blake Fell. To the north there is almost rectangular area of undulating high ground with at least six clearly identifiable summits. Darling Fell is at the south-west corner of this area, overlooking Loweswater. To the south and east it is steep sided. More gentle slopes drop away to the west, but to the north there is hardly any drop at all before we reach the start of the climb up to Sourfoot Fell. Low Fell to the east offers better views of Crummock Water and Buttermere and the surrounding fells, and rather blocks the view east from the slightly lower Darling Fell. However Darling Fell is a splendid viewpoint for Loweswater itself, for the fells south of the lake, and for the Cumbria coastal plain out towards Workington and Maryport. The main path across Darling Fell runs from west to east, leading from the old Mosser Road in the west (no longer suitable for vehicles but great for walkers) then runs along the summit of Darling Fell before dropping down into the valley of Crabtree Beck then climbing up to Low Fell. The fell is normally climbed via this path. It can also be reached easily from the north (although beware of the many maintained fences in this area), or up the valley of Crabtree Beck. Our walk in the Loweswater Fells visits Darling Fell towards the end. The grassy summit sits above the steep southern slope. There are two patches of higher ground, and the western one is probably just the higher. The eastern boundary of the fell is formed by Crabtree Beck, which flows from the slopes of Sourfoot Fell into the valley between Darling Fell and Low Fell. The northern boundary of the fell could be taken at Loftbarrow or at Sourfoot Fell. 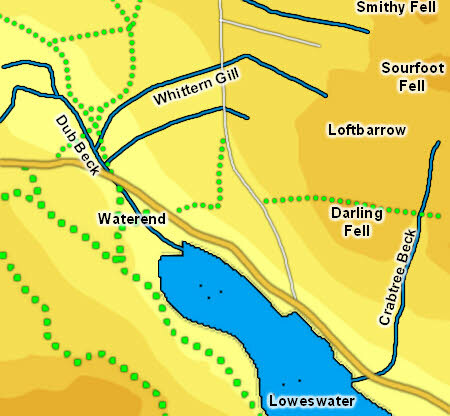 If we use Loftbarrow then the north-western boundary is formed by Whittern Gill, which flows west then flows into Dub Beck and turns east to run into Loweswater. If we use Sourfoot Fell then Mosser Beck is the boundary, flowing north-west then north-east into the River Cocker, while the western boundary is lost in undulating countryside. Darling Fell has a footing on Loweswater.